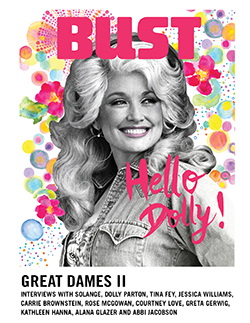 Can you guess who's on BUST's May/June 2019 magazine cover? 1) She was born in the U.K.
And no, her name is not visible on the above cover. Think you know who it is? Enter your guess below. We'll pick one winner at random from the correct answers to receive a 1-year subscription to BUST magazine, free (if you already subscribe, we'll add another year to your account).